Clump-forming deciduous perennial with succulent foliage of fleshy glaucous green leaves flushed brownish purple. Upright and branching dark red stems. 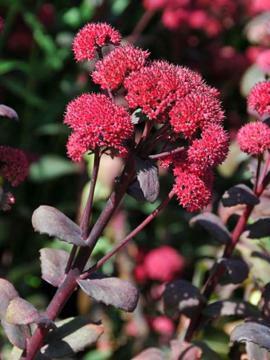 Compact heads of small pinkish red flowers in late summer and autumn. Best grown in rather poor, dryish soil in full sun. Rich soils tend to promote lush grown which causes the clumps to spread open at flowering time.